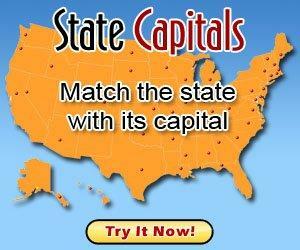 The capital and largest city in Idaho is Boise. Boise is also the largest city in Idaho. The abbreviation is ID, and Idaho residents are known as "Idahoans." The world's very first ski lift was installed in Idaho. The unofficial nickname of Idaho is the Gem State. It is called this because almost every type of gem has been found in Idaho. "Here We Have Idaho" is the state song. Idaho was the name of a steamship which traveled the Columbia River. When gold was discovered in the Clearwater River in 1860, diggings were called the Idaho mines. " Idaho" is a coined word, and is not a derivation of an Indian phrase "E Dah Hoe (How)" supposedly meaning "gem of the mountains." The Mountain Bluebird is Idaho's state bird. The Syringa is the state flower and the Western White Pine is the state tree. Idaho borders Montana, Nevada, Oregon, Utah, Washington, and Wyoming. There are no major bodies of water surrounding or near Idaho. Idaho is known for its agriculture of potatoes, wheat, sugar beets, and barley. Do you have facts that you'd like to contribute to our Idaho page? If so, please use our contact us form. We will probably need to fact check any contributions so please provide us with a link to a source to verify it. Want to know about preparing for the Idaho State Achievement Tests or the ISAT Standardized Test? Are you interested in information on Homeschooling in Idaho or a Idaho homeschool parent support group?